In 2001, Phil Lazo was inspired to write a song about trusting the Lord with his children. Two years later, his daughter was killed in a car accident. This tragedy and the song would change the trajectory of the lives of Phil and his wife Karen—taking them into circumstances they never imagined. Do you learn more from stories than expositions? 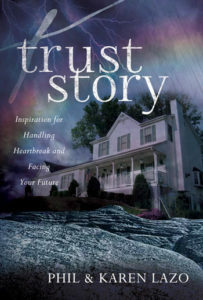 Imparting nuggets of practical wisdom and Biblical insights with the backdrop of stories of God’s miracles, this book will awaken your heart to trust the Lord more fully—even when life doesn’t go according to your best laid plans. Via PayPal. Free shipping within the USA and 10% of proceeds will be donated to World Relief (www.worldrelief.org). Via PayPal. 10% of proceeds will be donated to World Relief (www.worldrelief.org).